The NEW 2018 Bugaboo Cameleon3 Plus is the most recent instalment of Bugaboo's original and most popular signature pram that's been a part of family journeys for more than 15 years. Offering a smooth stroll, it’s versatile, easy to use and adapts to different situations. Go anywhere, from the city to the bush, with the small or big wheels in front. 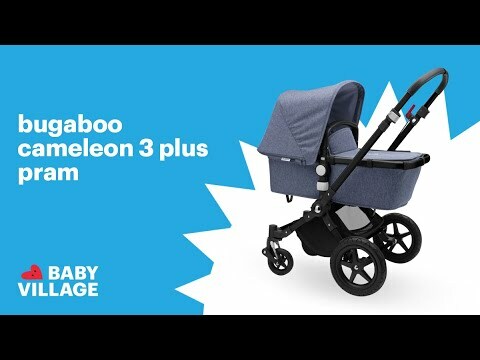 Bugaboo Cameleon3 Plus offers tremendous value is Baby Village's top value pram if you're in the market for a functional, well crafted single stroller. It’s full of practical features but lightweight so you can carry it with ease. New under-seat basket design allowing parents easier access to their things when the pram is in both the bassinet and seat configuration. Harness: 5 point safety harness. Handle Type: reversible and height-adjustable leather look handlebar. Wheels: Foam filled rubber tyres. Adjustable suspension: Optimal swivel wheel suspension based on infant to toddler weight.